What is this good for? It allows you to run any ESXi shell command remotely without enabling and using ssh! This means e.g. that you can start e.g. shell scripts (like William Lam's ghettoVCB.sh script) through a remote esxcli or a PowerCLI script. in an ESXi shell. Please note: This will not interrupt any VMs, but will drop any management connections like vSphere client and remote esxcli sessions! You can also deploy esxcli-shell through Update Manager by importing the Offline Bundle and adding it to a baseline. The hosts' acceptance level still needs to be changed (like described above) though, and you need to manually reboot the hosts or restart hostd on them, because the package does not force a reboot. hostname is the name of the ESXi host that you want to run the command on. username is the name of a privileged user on this host (normally root), and password is the password of this user. command1, command2 etc. are the shell commands that you want to execute (at least one is required). If a command contains spaces then enclose it in quotes (like "ls -la"). esxcli -s vESXi01 -u root -p *** shell cmd -c "vmkload_mod -l | grep e1000"
esxcli -s vESXi01 -u root -p *** shell cmd -c "lsof >>/vmfs/volumes/LStore1/lsof.log"
esxcli -s vESXi01 -u root -p *** shell cmd -c "vmkfstools -y 90" -d "/vmfs/volumes/DS01"
esxcli -s vESXi01 -u root -p *** shell cmd -c "cd /vmfs/volumes/DS01" -c "vmkfstools -y 90"
esxcli -s vESXi01 -u root -p *** shell cmd -c "echo -e \"answer1\\nanswer2\" | /opt/vendor/bin/program"
esxcli -s vESXi01 -u root -p *** shell cmd -c "(cat <<END" -c "answer1" -c "answer2" -c "END" -c ") | /opt/vendor/bin/program"
If you do not want to use an optional parameter then just specify the value $null for it. 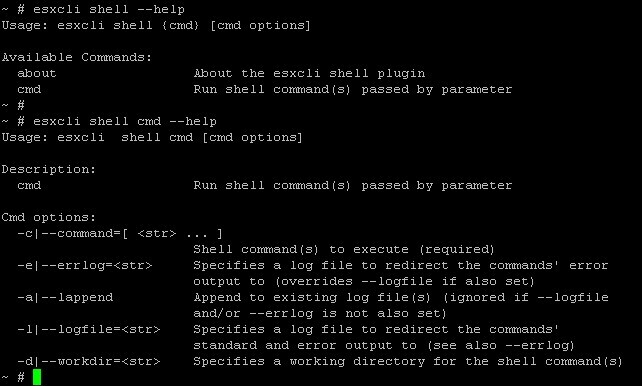 For auditing reasons any command that you type in a regular shell is logged to /var/log/shell.log. In version 1.1 of the esxcli shell plugin I added code that will also log all executed commands to this file. Unfortunately all the commands that are run through esxcli will appear as if they have been run by the user root - even if you used another account for the remote esxcli connection -, because they are run through the hostd daemon that runs in the security context of root. I haven't found a way to safely determine the remote user's account. with n being the new timeout value (in seconds). The default is 300 sec. (= 5 min.). You can also disable the timeout by using a negative value for n, but I would not recommend this. Please note that this feature requires PowerCLI 5.1. Great work Andreas..will be a great help. Can we deploy the plugin using update manager ? Yes, you can deploy through Update Manager. You still need to change the hosts' acceptance level though (like described in the post), and you need to manually reboot the hosts or restart hostd on them after the remediation, because the package does not force a reboot. Have you actually tested deployment of custom VIBs via VUM? From my testing, even after setting the acceptance level to CommunitySupported, it seems that VUM still prevents custom VIBs to be staged & installed. It works, I just tested the deployment of my esxcli-shell bundle with VUM in vCenter Server 5.1.0b and an ESXi 5.1 host. It will fail if a CommunitySupported VIB contains files that are not allowed in it (like your virtuallyghetto.vib), but this is not the case with the esxcli-shell VIB. Haven't seen much activity here, but does this plugin work with ESXi 6? yes, the plugin is still compatible with ESXi 6.0 (incl. U2). See the Wiki page. Hi Andreas, is this plugin compatible with ESXI 6.5? I would expect that it is still compatible with ESXi 6.5 (and 6.7), because there were no known changes introduced to the esxcli subsystem. However, I have not tried it myself, because I do not really see a purpose for this nowadays. What do you want to use the plugin for?